Most of us have very few practical tools to help us cope with solubility and dispersion issues. Simplistic ideas such as hydrophilic/hydrophobic, polar/non-polar cannot take a formulator very far. The infamous LogP (LogKOW) has done great harm because it pretends that a partition coefficient between octanol and water can say something profound about the solubility behaviour of complex molecules. Two molecules with the same LogP might have utterly different solubility characteristics. One of my favourite solubility tools is very powerful. The COSMO-RS approach to solubility uses a one-off quantum calculation of a molecule to then be able to predict how it will interact with solvents. The theory is profound and the methodology is highly successful in many areas. A package such as COSMOtherm can accomplish a great deal. On this site the focus is on tools that the practical formulator can use to get a good-enough understanding of a number of key solubility issues. Some of the tools such as DLVO and Zeta are powerful in their own right. The others, based on Hansen Solubility Parameters (HSP), are somewhat limited but still very useful. 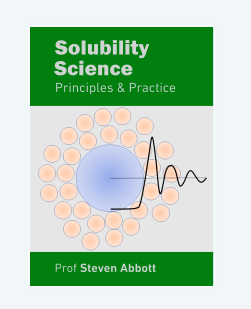 The limitations are partly because I have a commercial interest in the Hansen Solubility Parameters in Practice (HSPiP) package of software, datasets and eBook. And partly because the approach is so powerful that it needs more than a web interface to realise its full potential. The famous Pirika site is another resource with HSP power.